I love all of their results. 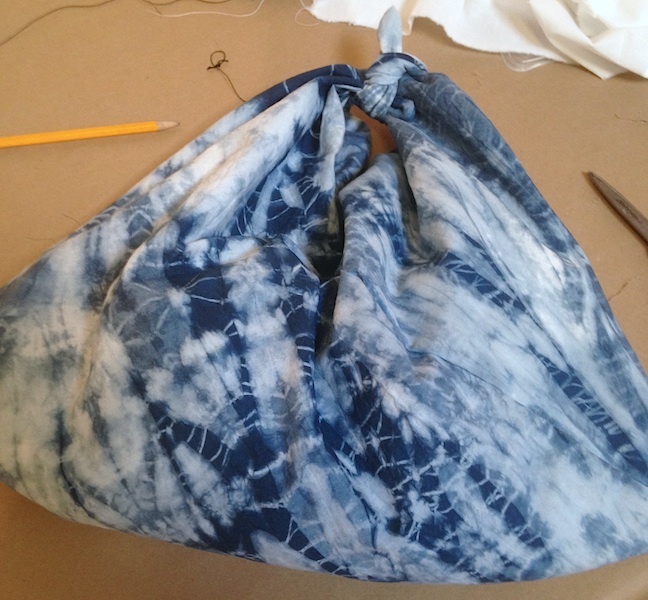 It was asking a lot to have them put pattern on cloth, dye it, then stitch these bags. 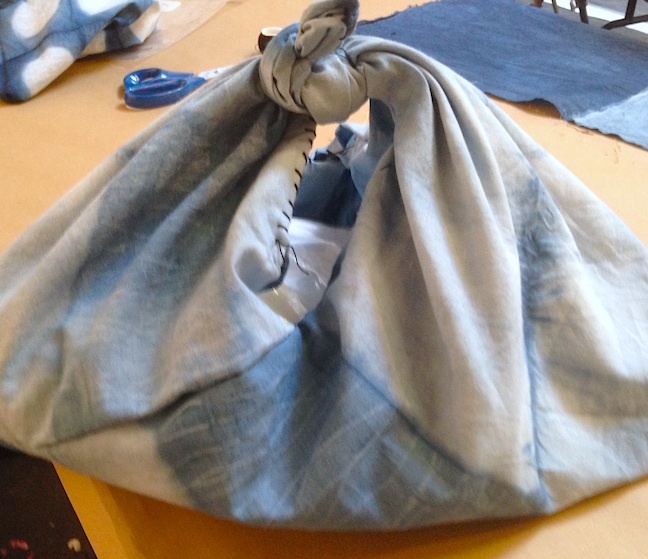 They also received a silk scarf which they also manipulated and dyed. It was quite a week. I confess, this 90+ degrees heat makes me feel quietly ornery. There’s a stubbornness and reluctance stirring – there’s a refusal to want to do anything. Is it just the heat? I can’t decide. In spite of it, though, I’ve been at Artspace this week. I have no right to feel this way. The incoming results from my students are a delight. It may have taken a few slow dips in the color to convince them. Their work gets better everyday and they seem now, under its spell. Seeing them so engaged is quite rewarding and affirming. It gives me pause, in spite of that reluctance. Well, it may not look that different, but it’s smaller than the earlier piece (which is still in progress). A friend suggested a 9 patch and I think that works. Another suggested colored threads (yes, definitely!). We talked about different approaches to stabilizing the pieces. There are a number of approaches to that. I don’t want to complicate things too much. It has been a gloomy, chilly day with a little precipitation – a great day for this. Actually, it’s been on my mind for some time – and good thing there’s still some for prep. I submitted the process last fall, but when it comes down to the specifics, I still need to plan further. It’s only because I like to change things a bit every year. So, now it’s time to draw up that supply list for Artspace and I really need to know how much fabric and other supplies I’ll need. So, I’m walking through it – making a sample piece or two. If the kids don’t rise to it, we can make adjustments. I like to see what they can do or want to. We’ll be together for a week in the afternoons (rising 3rd – 5th grade). I need to post class information on my workshop page – haven’t done so as yet. At any rate, the kids need to be engaged (at least that’s the goal!) and that’s my challenge. 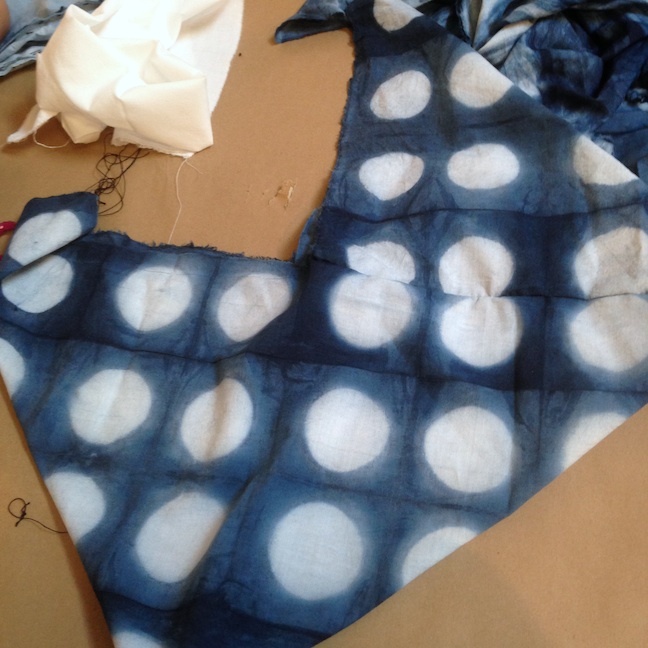 The image is of small samples, results from a henna/indigo vat – something I’ve been wanting to experiment with since this earlier this summer. I’m finally able to focus on it and am enjoying the results. I had in mind the coming workshop for classroom teachers, upcoming at Artspace – thinking of presenting a vat that would be safe and approachable for the classroom. In this case, I was thinking more of the younger set – the elementary group. Of course, it’s really beyond that, but they were my focus since I’ve had some experience with presenting the vat to that age group (and higher). I don’t know if at this point, if the workshop is going to come off (there’s still room…), but I’ve gained something just by the experiment. It’s a healthy direction and as I said earlier, I like the results and look forward to further work with it. OK, in this case, the small rocks or pebbles is just a means to an end. I suppose. I’ve been trying to bring to a conclusion my plans for tomorrow’s first lesson at Artspace – rising 3rd – 5th grade. I have a strategy in mind, apart from my students’ activities. It’s the first day on the heels of having arrived home (today) from teaching a workshop in the mountains. I’m trying to keep things simple and the rocks will help. They will have everything to do with tomorrow’s lesson involving that “blue magic.” Having just collected and rinsed the rocks, it’s now time to re-pack a few things, only for the day. That workshop in the mountains? More about that later…things to think about, pictures to peruse and words to gather. I hope the image will provide a little spark. The season for workshops is here. 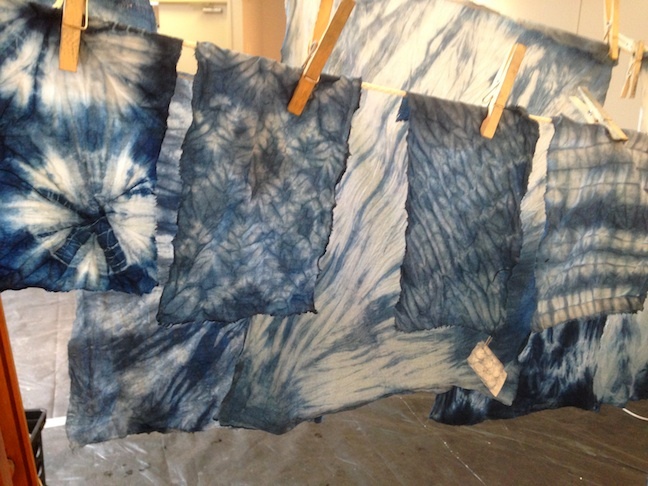 Indigo seems to love the summer heat and humidity and July is a perfect time for learning about it (and of course, shibori!). My youth class at Artspace is fast filling up, but there’s still room in the weekend workshop for adults later in the month. It isn’t too late to sign up. All information & links are on my “Upcoming Workshops” page. There’s also the workshop at the Florence Thomas Art School in Glendale Springs, NC. 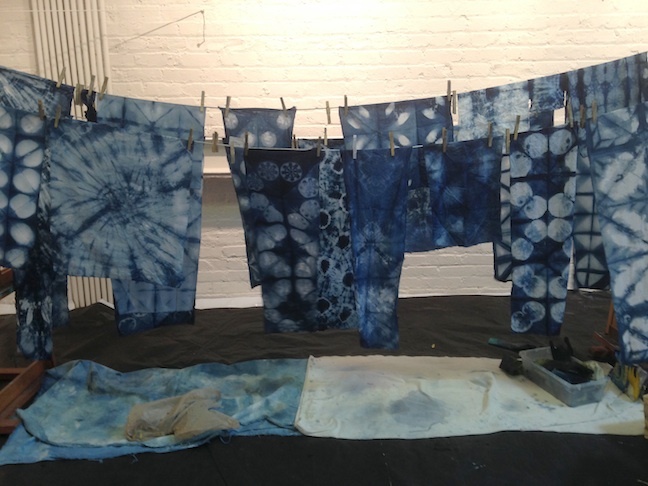 Both Janine LeBlanc (Gregg Museum) and I will be teaching the characteristics of the indigo vat and aspects of shibori there. I was, really, head over heels, lovin’ the results of my last ‘assignment’ for these kids. The kids really rose to it. I had my doubts about giving it, but they took off and made the sweetest little yokai fabric books. This was probably the quietest class I’ve taught at Artspace. Usually they’re more active, but it must have been the early hours in the first week after school. I have to hand it to them. It is, just about…tomorrow in fact…at Artspace. Youth classes begin and also another summer. Wa Osoroshii! It’s Scary! 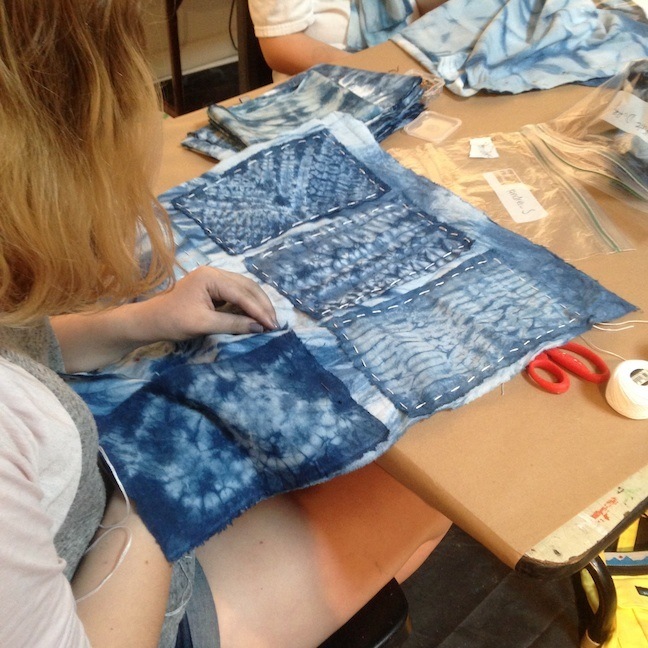 takes place next week – a mixed media class for rising 3rd to 5th graders. It’s a full class – 12 students (energetic, I’m sure!) – that started with 6 then quickly filled over this last week. Practice and walking through what they’ll be doing helps me to warm up and keep things fresh. New ideas come to play during a time like that. I look forward to seeing what the kids come up with. In the dogs days of summer, in August, in Japan, it’s fairly traditional to send a summer greeting. These days, they may send one by “e” but by hand, of course, is better. 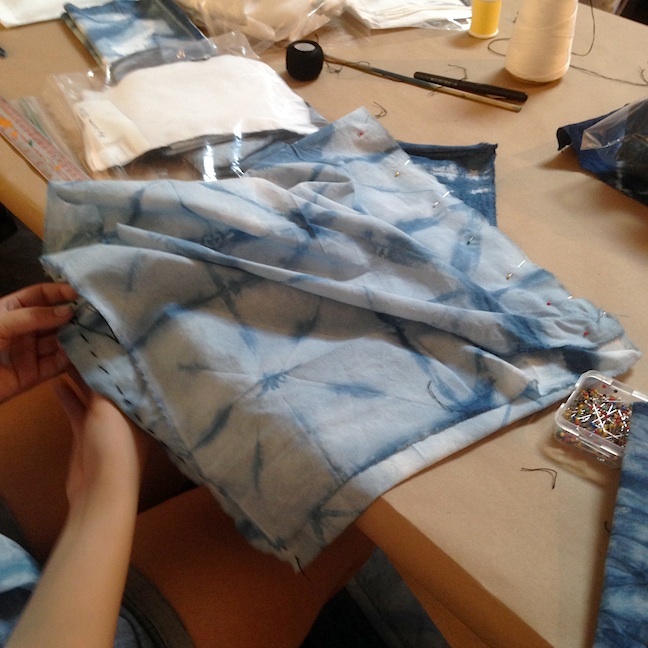 The 3rd – 5th graders began their “Matsuri” class with creating a “Shochuumimai” on fabric. They drew their cooling summer images, then added their greeting in hiragana. That part involved a quick lesson in hiragana and I thought they learned their lesson well.